王震, 李金秀, 张彬, 冯浩, 李金榜. 小麦玉米一体化氮肥运筹对小麦产量和氮素利用的影响[J]. 植物营养与肥料学报, 2018, 24(5): 1169-1177. WANG Zhen, LI Jin-xiu, ZHANG Bin, FENG Hao, LI Jin-bang. Effects of different nitrogen applications on yields and nitrogen utilization efficiencies of wheats under integrated nitrogen management for wheat–maize rotation system[J]. Journal of Plant Nutrition and Fertilizers, 2018, 24(5): 1169-1177. Abstract: 【Objectives】 Yields, nitrogen use efficiency and nitrogen balance have been effective ways in evaluation of nitrogen fertilization. The proper annual amount and allocating ratio of nitrogen fertilizer in wheat and maize were studied in this paper. 【Methods】 Wheat cultivar of Xinmai21 (X21) and Wanmai20 (W20) were used as the material, a three-year located split-block experiment was conducted in the wheat–maize rotation system, Henan Province. Three annual rates of nitrogen application were applied as 300, 450 and 600 kg/hm2, three nitrogen distribution proportions in wheat and maize were applied as 4∶6 (B4), 5∶5 (B5) and 6∶4 (B6). The wheat yield, nitrogen use efficiency and nitrate accumulation in 0–100 cm soil were investigated. 【Results】 The nitrogen fertilizer application rate and proportion had significant effect on yields and their components. For wheat cultivar X21, the treatments of N450 in ratio 5∶5 and 6∶4 and treatment of N600 in ratio 4∶6 all produced satisfactory yields. For wheat cultivar W20, satisfactory yields were obtained in annual nitrogen rates of N450 in both ratio of 5∶5 and 6∶4. The annual total yield was the highest under the N600 in ratio 4∶6, there was no significant difference between N450 in ratio 4∶6, N450 in ratio 5∶5 and N600 in ratio 4∶6. The path analysis suggested that spike was the main factor in X21 yield, while the kernel number was the main factor in W20 yield. The optimum nitrogen use efficiency of X21 and W20 were N450 kg/hm2 in ratio 5∶5 and N600 in ratio 4∶6, respectively. 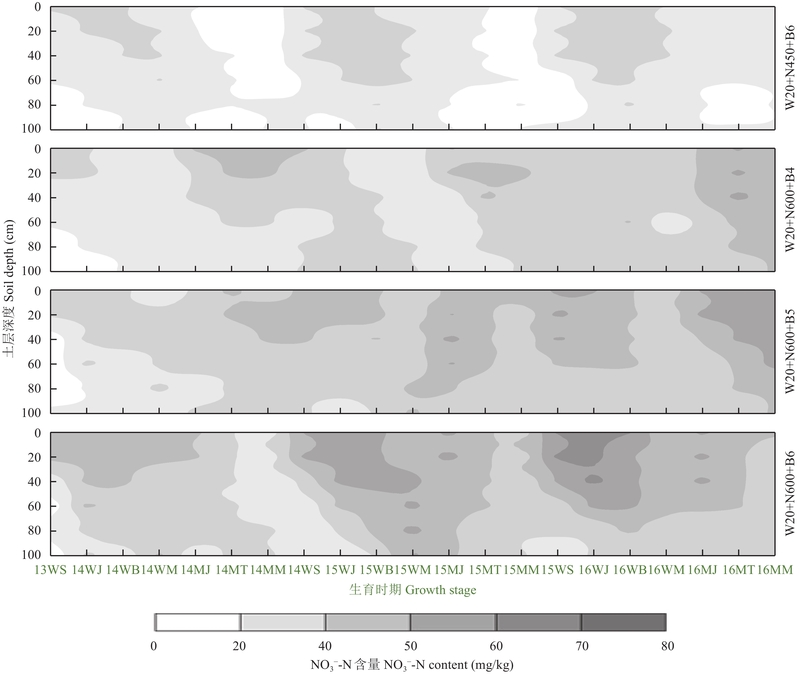 The nitrate accumulation of 0–100 cm soil depth was not obvious in N450 in ratio 5∶5, and there were nitrate accumulation with different degrees in other treatments except N300. 【Conclusions】 Comprehensive considering the annual yields and fertilizer nitrogen use efficiencies, the reasonable annual application amount is 450 kg/hm2, allocated in ratio of 5∶5 in wheat and maize under the experimental condition. 注（Note）：同一品种同列数据后不同字母表示处理间差异达 5% 显著水平 Data followed by different letters in the same column within a cultivar indicate significant differences at the 5% level among treatments. 注（Note）：x1—成穗数 Spike; x2—穗粒数 Kernel number; x3—千粒重 Thousand kernel weight; y—产量 Yield; PMCC—皮尔森相关系数 Pearson product-moment correlation coefficient; DPC—直接通径系数 Direct path coefficient; IDPC—间接通径系数 Indirect path coefficient. 赵荣芳, 陈新平, 张福锁. 华北地区冬小麦–夏玉米轮作体系的氮素循环平衡[J]. 土壤学报, 2009, 46(4): 684–687. 国家小麦产业技术体系. 中国小麦产业技术发展报告[M]. 北京: 中国农业出版社, 2015. 118–120. National Wheat Industrial System. China wheat industry technology development report[M]. Beijing: China Agriculture Press, 2015. 118–120. 张亦涛, 任天志, 刘宏斌, 等. 玉米追氮对玉米//大豆间作体系产量和土壤硝态氮的影响及其后茬效应[J]. 植物营养与肥料学报, 2016, 22(1): 104–110. Zhang Y T, Ren T Z, Liu H B, et al. 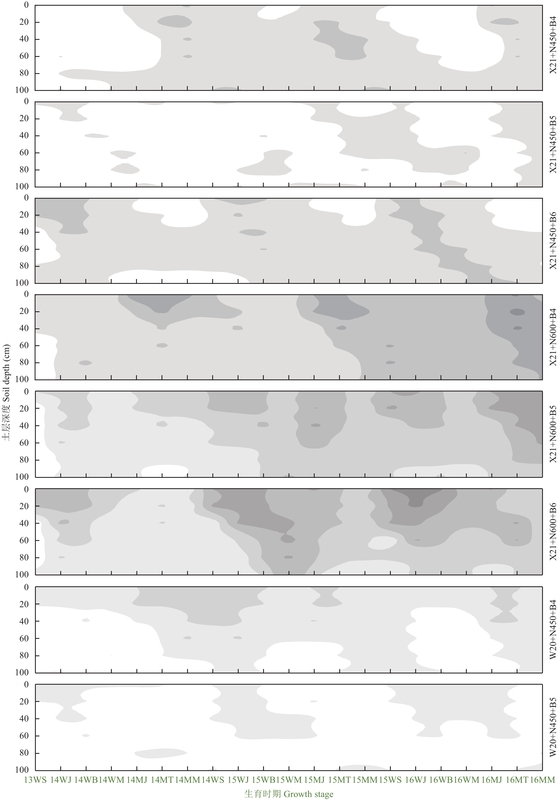 Effect of topdressing nitrogen of intercropped maize strip on intercropped crop yields and soil nitrate nitrogen as well as its residual effect[J]. Journal of Plant Nutrition and Fertilizer, 2016, 22(1): 104–110. 刘新宇, 巨晓棠, 张丽娟, 等. 不同施氮水平对冬小麦季化肥氮去向及土壤氮素平衡的影响[J]. 植物营养与肥料学报, 2010, 16(2): 296–303. Liu X Y, Ju X T, Zhang L J, et al. Effects of different N rates on fate of N fertilizer and balance of soil N of winter wheat[J]. Plant Nutrition and Fertilizer Science, 2010, 16(2): 296–303. 巨晓棠, 张福锁. 中国北方土壤硝态氮的累积及其对环境的影响[J]. 生态环境, 2003, 12(1): 24–28. 巨晓棠. 氮肥有效率的概念及意义—兼论对传统氮肥利用率的理解误区[J]. 土壤学报, 2014, 51(5): 921–933. Ju X T. The concept and meanings of nitrogen fertilizer availability ratio—Discussing misunderstanding of traditional nitrogen use efficiency[J]. Acta Pedologica Sinica, 2014, 51(5): 921–933. 贺美, 王迎春, 王立刚, 等. 应用 DNDC模型分析东北黑土有机碳演变规律及其与作物产量之间的协同关系[J]. 植物营养与肥料学报, 2017, 23(1): 9–19. He M, Wang Y C, Wang L G, et al. Using DNDC model to simulate black soil organic carbon dynamics as well as its coordinate relationship with crop yield[J]. Journal of Plant Nutrition and Fertilizer, 2017, 23(1): 9–19. 巨晓棠, 潘家荣, 刘学军, 等. 北京郊区冬小麦/夏玉米轮作体系中氮肥去向研究[J]. 植物营养与肥料学报, 2003, 9(3): 264–270. 朱红彩, 范永胜, 赵娟, 等. 国审小麦新品种新麦21的选育[J]. 河南农业科学, 2011, 40(2): 54–56. Yan W K, Kang M S. GGE Biplot analysis[M]. CRC Press, 2002. 李金秀, 王震, 张彬, 等. 小麦/玉米一体化氮肥运筹对矮抗58产量的影响[J]. 山西农业科学, 2016, 44(9): 1304–1307. 曹倩, 贺明荣, 代兴龙, 等. 密度、氮肥互作对小麦产量及氮素利用效率的影响[J]. 植物营养与肥料学报, 2011, 17(4): 815–822. Cao Q, He M R, Dai X L, et al. Effects of interaction between density and nitrogen on grain yield and nitrogen use efficiency of winter wheat[J]. Plant Nutrition and Fertilizer Science, 2011, 17(4): 815–822. 彭永欣, 姜雪忠, 郭文善, 等. 小麦栽培与生理[M]. 南京: 东南大学出版社, 1992. 145–158. Peng Y X, Jiang X Z, Guo W S, et al. Cultivation techniques and physiology of wheat[M]. Nanjing: Southeast University Press, 1992. 145–158. 张福锁, 陈新平, 陈清, 等. 中国主要作物施肥指南[M]. 北京: 中国农业大学出版社, 2009. 66–67. Zhang F S, Chen X P, Chen Q, et al. China crop fertilizer application guide[M]. Beijing: China Agricultural University Press, 2009. 66–67. 张琪, 丛鹏, 彭励. 通径分析在Excel和SPSS中的实现[J]. 农业网络信息, 2007, (3): 109–110. 赵倩, 姜鸿明, 孙美芝, 等. 山东省区试小麦产量与产量构成因素的相关和通径分析[J]. 中国农学通报, 2011, 27(7): 42–45. Zhao Q, Jiang H M, Sun M Z, et al. 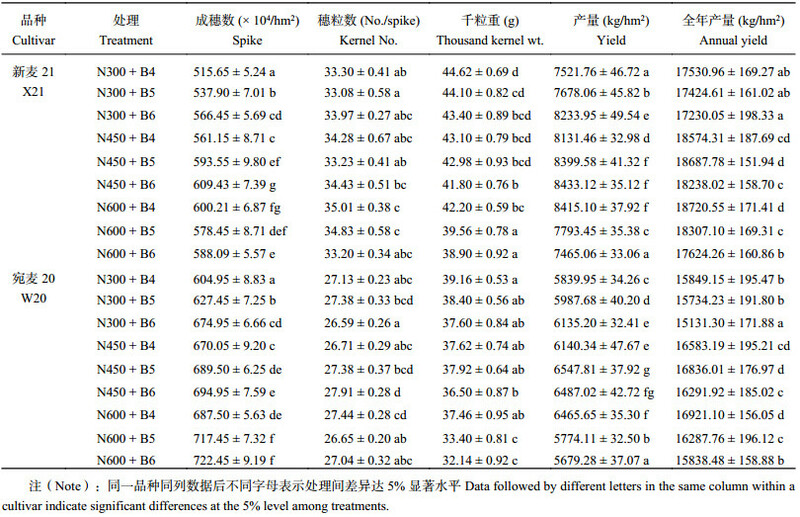 Correlation and path analysis of yield components of winter wheat varieties with high yield potential cultured in regional trials of Shandong province[J]. Chinese Agricultural Science Bulletin, 2011, 27(7): 42–45. 周芳菊, 陈桥生, 张道荣, 等. 小麦产量构成因素的相关性分析[J]. 湖北农业科学, 2012, 51(23): 5287–5289. 陆扣萍, 闵炬, 施卫明, 王海龙. 不同轮作模式对太湖地区大棚菜地土壤氮淋失的影响[J]. 植物营养与肥料学报, 2013, 19(3): 689–697. Lu K P, Min J, Shi W M, Wang H L. Effect of rotation patterns on nitrogen leaching loss from protected vegetable soil in Tai Lake region[J]. Journal of Plant Nutrition and Fertilizer, 2013, 19(3): 689–697. 阎素红, 杨兆生, 王俊娟, 等. 不同类型小麦品种根系生长特性研究[J]. 中国农业科学, 2002, 35(8): 906–910. 屈佳伟, 高聚林, 王志刚, 等. 不同氮效率玉米根系时空分布与氮素吸收对氮肥的响应[J]. 植物营养与肥料学报, 2016, 22(5): 1212–1221. Qu J W, Gao J L, Wang Z G, et al. Effect of nitrogen rate on temporal and spatial distribution of roots and nitrogen uptake of maize with genotypes of high or low nitrogen efficiency[J]. Journal of Plant Nutrition and Fertilizer, 2016, 22(5): 1212–1221. 杨延兵, 高荣岐, 尹燕枰, 等. 氮素与品种对小麦产量和品质性状的效应[J]. 麦类作物学报, 2005, 25(6): 67–70. Yang Y B, Gao R Q, Yin Y P, et al. Effects of nitrogen and variety on yield and quality traits of winter wheat[J]. Journal of Triticeae Crops, 2005, 25(6): 67–70.